Q: What’s the impact of advertising? A: Just look into your garbage cans. This is the world we know of today. Shaped by the 5 forces of: rapid urbanisation; cities cover just 3% of the planet’s land surface but is already home to more than half of it’s 7.3 Billion people and is expected to increase to 11 Billion in 2100¹, demographic and social change; increasing medical breakthroughs have resulted in lower mortality rates and advancements in social and welfare programmes have supported the well-being of older people leading to more people living longer, natural resources depletion; post industrial revolution we have continuously been heavily dependent on oil and gas even till today, technological breakthroughs; the dawn of the Internet, Digital-era and the shifts in economic powers; from the West to the East, and the North to the South. We live in an era of mass consumption and mass production. Essentially, we live in overabundance. We know this is happening just by looking around us – our planet’s landfills are overflowing, we are sending our trash into space and dumping it there and we only need to look at the magnitude of the Great Pacific Garbage Patch to understand the severity of the effects of our overconsumption. Yet materialistic consumption will continue to rise driven by the expansion of capitalism, among the new rich-world, middle-classes. Birth of a new generation, that just did not care. I call it the Don Draper-generation. In the infamous scene from TV series Mad Men, we see Don Draper, his wife and children have a picnic in the park. They are having a good time and when it is time to leave, they pack and drive off. But the camera in this scene is in a wide shot and viewers are left, somewhat shell-shocked, by the ‘mess’ Don Draper’s family had left behind at the park. Don Draper had tossed empty cans of soda into the bushes, while his wife, Betty, abandons all their picnic waste on the ground, without a second thought. The portrayal of this 60’s generation had showed us today, that there is already a casual disregard for the environment. 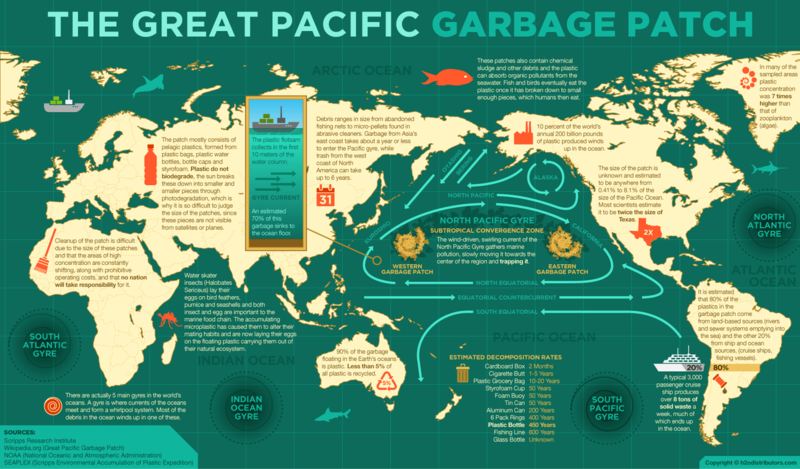 Check out Buzzfeed’s: Where does your trash go? In the similar time period as the rise of the Don Draper generation, Rachel Carson published a book in 1962 entitled Silent Spring. She writes on the dystopian future where industrial practices have destroyed nature. In this book, she helps to shine a light on one of materialism’s darkest secrets: the senseless trashing of the planet we live on. Sounds familiar? Does it look exactly like the path we are taking, today? If you do not believe me, then have a look at this. There is the Syngenta Photography Award exhibition: Scarcity Waste taking place from 11 March to 10 April at Somerset House in London which raises our awareness and shows us first hand encounters of the terrible things we humans are doing to our planet, and how we are on the verge of destroying it. What’s advertising got to do with it? First, let me just say this – advertising has been around for a very long time, I know, and modern advertising only took off in the 19th century. However by the 20th century, the practice of advertising had increased dramatically as industrialisation expanded the supply of manufactured products. But it is during the Great Depression, that advertising began to seep into the deep fabric of society. Advertising had been used as a way to address overproduction, and prop under consumption in the Industrial Age. At that time, President Hoover and Roosevelt deemed advertising to be a solution to create this virtuous circle where everyone benefitted – with more jobs and more wages, people with disposable income were encouraged to spend. So, the advertising industry was the job of creating ‘desire’. This went on for many, many, many years until one day people started to get enough. So the advertising folks were now forced to invent a new ‘throwaway’ culture to keep the wheels of the manufacturing cycle turning. This lead to the production of goods not made to last, but built to break. We still see this happening, today. The job of advertising used to be just to evoke desire, but now is at a tipping point. So, we have to ask, are we close to the point of ‘needs saturation’? Just how many more cars does one family need to have? Did you know that 30% of all city pollution is caused by people trying to find a space to park²? Each of us contributes to climate change more than we think we do. We have created a right ol’ mess. So let’s look at today. Why do we continue to manufacture and create desire for a need that isn’t really there? Because we hope (yes, we really do) that – there will still be: some more people, who will buy, some more stuff. And we do remain hopeful that the rise of the middle-classes will continue to buy into this materialistic self-expression in order to signify their statuses. As we know of the effects of capitalism, we as a society are now consciously aware of who is ‘above’ or ‘below’ in the pecking order. And it is through stuff, that we also know we can climb up or slip down this ranking at any moment. So now we include the element of technology. Technology has made the biggest impact in most industries, we are obsessed with data and the use of technology. But what is the actual intent of technology? Nobody seems to know. It is still the bright, shiny new thing that gets ears to perk up. Surely, technology is just the mere amplifier of the intent, is it not? The advertising industry too is using technology to manufacture demand that isn’t really there. Surely, it is just to squeeze the sponge dry for the very last drop of demand, rather than solving the big problems?It doesn’t sound very sustainable, or long-term future proof! At least not to me! This is the fascinating part which I find most exciting. It is an unknown fact to most that throughout my education, I was studying to become a marine biologist. So for most of my academic life, I have been very drawn to the sciences. It was only the last 4 years of university life that I had decided I wanted to get into Business, which I then majored in Marketing and Telecommunications Management. Today, combined with over 12 years in the advertising industry, I passionately believe that there is a possibility for advertising that can work with the world to solve big problems. There is an extraordinary and untapped role for advertising to reallocate capital that can have the effects, which addresses and deals with the mega trends to fuel the chain for long-term growth and development. Say for example, you’re an advertising folk working on a Food client. 1. Make it your duty to work with your client to redefine value and not exhaust natural resources. This can be done through the use of technology, for example, to solve crop productions for farmers – thus improving local, seasonal and organic rise in food productivity and yields. 2. Similarly if you’re a media planner, you have the ability to shape your promotional plans in an efficient way that have effects throughout the supply chain – media plans that reflect how campaigns are planned to maximise paper and plastic usage used in promotions, the cutting down on logistics frequencies and transportation of goods between countries thus reducing carbon footprint to the actual goods wastage to run the promotion. 3. If you’re a suit in an advertising agency, use creativity in a different way – it can be through your influence and position to drive the sustainability narrative in the boardroom. Use client-facing opportunities to unlock creativity among leaders of companies, who will shape the world of tomorrow and authentically buy a strong sense of purpose. 4. If you’re in a leadership position, cultivate talent that will join you to play a much larger role in society. Paul Polman of Unilever is a classic example. As a strong believer in sustainability – against all odds, he has single-handedly redefined a large corporation’s culture and have been the driving force in recruiting like-minded talent who will help fulfil Unilever’s Sustainable Living Plan. I’ll end with this: it is now our turn and obligation to do good business. In the advertising industry, now more than ever. Challenge what the business vision says, what matters most is what the business vision does. We are in the position to make irresistible brands, sustainable and sustainable brands, irresistible. In order to predict the future, you have to invent it.